I'm pleased to officially announce the video component of The Sketchnote Handbook! I've just signed the contract to produce a collection of short videos related to the book chapters with my good friend Brian Artka. Check out the great work Brian does, including his Milwaukee Leatherworker video and his other short films. I'm very excited to have Brian on my team. Last week I started writing chapter one of The Sketchnote Handbook. This chapter will set the tone for the overall book, so it's critical. I've created several drafts and plan to have a final first draft to Peachpit for review this week. 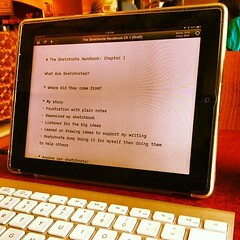 My writing toolkit — an iPad, bluetooth keyboard and iA Writer have worked well for creating words for chapter 1. It's very convenient to have access to the same text file via Dropbox on he MacBook, where I can make further edits. I'm experimenting with the Mac OS Lion's versioning in iA Writer. Feels strange to see 'Save a Version' instead of 'Save' but having rollback may save my bacon. My next task: take the first draft of chapter 1 and sketching out the structure of the pages — sorting out where text, type and illustrations might go. This will help me get the balance of writing and illustration right. These sketches of each spread will also help show Peachpit where the book is headed, since it features so much illustration. A font created from my handwriting is a key part of the book and I've made progress here as well. The text-weight version of my handwriting with full character sets has been drawn, scanned and sent to my font-making partner Delve Withrington. 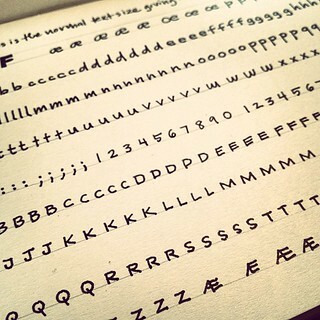 He will trace the letterforms and create a font from them. I still have to create a bold and italic version of the handwritten body text font along with a new, larger font to be used for the book's subheads. We plan on offering the complete set of fonts for sale as well, once the book is released. We're now less than a week away from our visit to the Bay area. A private mini-worksop is scheduled for the staff at Duarte where I'll tell my story of sketchnoting and show their team advanced sketchnoting techniques. On Wednesday the 11th I'll be speaking at Salesforce.com at 6:30, talking about "Sketching - The Visual Thinking Power Tool". I'll share my own work process, tell how sketches help us think and solve problems and have the audience do few sketch exercises. Should be a blast! The Eventbrite tickets are free, so come on down. The reception starts at 5:30. I'd love to have you with me at Salesforce's HQ Wednesday night. I believe my lecture will be recorded and shared by Salesforce on YouTube — if so, I'll post the video here on the blog. I still have a long way to go, but I'm excited to really be going full steam ahead on this project. Talk to you again in a few weeks. Mike you and your talent are definitely leaving a creative mark on the world. Isn't it GREAT to see ALL YOUR HARD WORK is paying off.